Digital cameras and pocket camcorders like the Flip Video line are great to bring along for vacations and trips and special events (see earlier post). But these electronic devices are not so happy about being exposed to hostile weather and conditions, including rain and water and dust and snow. The Aquapac line of weatherproof cases protect your devices during activities including boating, skiing, snowboarding, biking, hiking and snorkeling, with models for cameras and camcorders, iPod, iPhone, iPad, mobile phones, and MP3 players. And now there are Aquapac Waterproof Case models for Flip camcorders, joining a growing line of accessories for Flip camcorders, including wide-angle lens, external microphones, battery extenders, and external storage (see earlier post). The Aquapac cases are made from a soft but strong plastic that lets you operate your devices through the material, and yet is optically clear for shooting above and under water. They are waterproof to 15 feet, and remain flexible to -40 degrees. They seal tight at the ends with a clever design using easy twist clamps. The Aquapac Waterproof Cases for Flip camcorders are available for $30 from the Flip and Aquapac sites. See my Digital Camcorders Gallery for more on the Flip line and other digital camcorders. If you like the idea of stylish backlit keyboards like the Logitech Illuminated Keyboard that are easy to use and easy to see, then Logitech has a new version, now with no cord to get tangled up -- the Logitech Wireless Illuminated Keyboard. These are full-size keyboards with a palm rest, and both feature bright backlighting with laser-etched keys so only the character symbols are illuminated. The Wireless Illuminated Keyboard is designed to work for up to 10 days of battery life, and recharges with a microUSB cable in 3 to 6 hours. It includes power management features to conserve energy, including an on/off switch, automatic brightness adjustment to ambient light conditions, and hand proximity detection to turn on and off the backlighting as it detects approaching hands. The keyboard uses the Logitech Unifying receiver technology over 2.4 GHz wireless -- Plug in the low-profile wireless receiver into a PC's USB port for easy setup. This also works with other compatible wireless mice and keyboards. The Logitech Wireless Illuminated Keyboard is priced at $99 (around $89 street) and the Logitech Illuminated Keyboard is $79 ($64 street). See my Portable Peripherals and Accessories Gallery for more on these and related products. Are you ready for 3D? Have you enjoyed 3D movies? Interested in enjoying 3D movies or games at home? If you're intrigued by the possibilities of shooting, creating, and sharing your own 3D pictures and videos the good news is that you actually can get started doing 3D with minimal costs and hassle by using your existing gear and displays. I'm back at the Princeton University IT Seminar series at noon on Wednesday, November 17 for a talk titled Step Out of the Plain -- 3D is the Next Dimension for Consumers. I'll discuss the 3D market, and explore the history, technology, and formats for stereo viewing. Then I'll review 3D TV and PC products for the home, show cameras for 3D shooting, and demonstrate software for doing your own 3D editing. 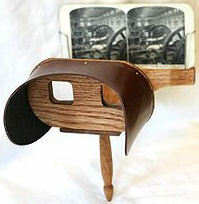 And I'll have lots of fun 3D gear to demo, including stereoscopic viewers and 3D images of Princeton and New York. And everybody gets their own pair of 3D red/cyan glasses! So put on your 3D glasses, and come step out of the plain into the next dimension in entertainment and sharing. This seminar series is free and open to the public -- Bring your lunch, but come early for cookies. 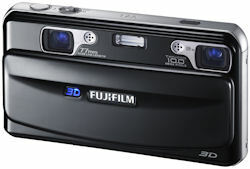 Fujifilm kindly loaded me the Fujifilm Real 3D W3 digital camera to demo at my recent 3D talk. This is a clever design that replicates our stereo vision by including two separate 10-megapixel CCD sensors and dual FUJINON 3x optical zoom lenses that are spaced on the front of the camera like our eyes. The result is powerful 3D images (and video) that look great on the computer monitor, on the projection screen at the talk, and even printed on stereocards for olden-days viewing. The W3 is the successor to last year's Fujifilm W1, adding higher-res images, with video up to 720p (1280x720, 16:9 widescreen, at 24 fps), a larger widescreen 3.5” LCD, and Mini HDMI port for viewing directly in HD displays. The back display uses lenticular 3D technology, so you can view your images (and preview the shot) in 3D, with no glasses required. The W3 still shoots "regular" 2D photos as well, swapping between 3D with a dedicated button, including simultaneously capturing in 3D and a standard JPEG. Since there are two imagers available, it also smartly offers 2D Dual Shooting modes, to simultaneously capture the same scene with different color, zoom, or sensitivity settings. The 3D photos are stored in MPO (Multi-Picture) format, with two JPEG images (for the left and right eyes) stored in the same file. Fujifilm provides MyFinePix Studio software for Windows as a free download to import and do basic editing with the 3D photos and video. 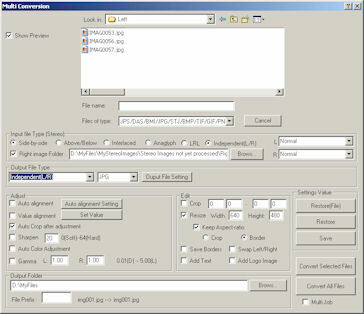 Other 3D software tools like Roxio Creator 2011 (see previous post) can import (and export) in MPO format, and offer more display flexibility and editing features. Otherwise, since a MPO file is basically JPEG, you can rename the file to .JPG and view the first image with standard photo viewers. Similarly, the 3D videos are stored in 3D-AVI files, using the AVI format as a container to hold individual video sequences for both the left and right eyes. Again, existing video software can play these files and see the first stream, but interestingly Media Player in Windows 7 sees both streams, and plays them simultaneously in two separate windows. See my Digital Cameras Gallery for more details on the Fujifilm W3 and other interesting imaging devices and accessories. Princeton has posted a nice summary of my presentation on 3D: The Next Dimension there last Wednesday (see previous post). The podcast of the talk already is available as a MP3 file. The podcast also will be available for easy download to iTunes, and iPhone, iPod, and iPad devices on the Princeton iTunes U channel (click to open in iTunes). See a full list of my talks at Princeton, with links to abstracts, presentations, and podcasts (MP3 and iTunes U). Apple has released the iOS 4.2 Software Update, bringing all the goodness of the new iPhone 4 software from earlier this summer to the iPad tablet (and also bringing the same release to the iPhone and iPod touch). The 100-some new features include multitasking, folders, unified inbox for all your mail, Game Center for Internet gaming, AirPrint, and AirPlay wireless streaming (see the Apple iPad Features pages). - Multitasking support allows you to keep working, for example, while files are downloading in iTunes, and non-Apple apps now can continue to work in the background, to play audio, monitor your location, or receive network alerts. As a shortcut, double-click the Home button for quick access to recently used apps, and scroll left for immediate Brightness and Music controls. - Folders on the Home screen help you better organize your growing collection of apps. To make a folder, hold down on an app to edit the screen (the start wiggling), and then drop one app on top of another. - AirPrint adds background printing over a local wireless network, but only to AirPrint-enabled printers (see the list of compatible HP products). This works with Apple apps including Safari, Mail, Photos, and iWork, as well as third-party apps with built-in printing. Upgraded versions of Keynote, Pages, and Numbers also are available from the App Store with AirPrint support. - Similarly, AirPlay provides wirelessly streaming of videos, music, photos over Wi-Fi to the Apple TV, to AirPlay-enabled speakers and receivers, and other speakers through the Apple AirPort Express. 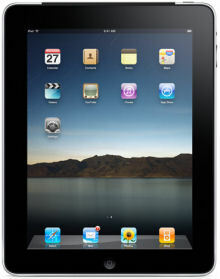 See my Apple iPod / iPhone / iPad Gallery for more on the iOS upgrades and the Apple portable products. If you're intrigued by the possibilities of 3D stereography, then you can get started experimenting with making and viewing your own stereo images and videos without requiring buying expensive new equipment and software. As described in my article on 3D - The Next Dimension (see earlier post), you can download sample 3D files of images and video to try out, and even use your existing 2D digital camera and camcorders to create your own stereo imagery. Then to view and edit and share the 3D material, you can get started with the 3D software tools from the Stereo Maker site. This extensive collection of tools is being actively updated, and includes StereoPhoto Maker, StereoMovie Viewer, Stereo Movie Maker, and Stereo SlideShow Maker. StereoMovie Player is a 3D video player that works with the common video file types supported by Windows Media Player, including MPEG, AVI, and WMV. It supports a variety of stereo file formats, including side-by-side, above/below, and interlaced, including the 3D-AVI format used by the Fujifilm Real 3D W3 digital camera (see earlier post). And StereoPhoto Maker is an extensively-featured photo viewer and editor, again supporting a wide range of still image file formats (including MPO from the W3). It has tools for image correction and enhancement, including auto alignment and color correction. You then can add stereo text, logos, and borders to your images, and share the results as a slideshow, animated GIFs, or HTML, or print hard copy as multiple images, or stereo cards. The Stereo Maker tools also support a wide range of stereo display types, including free-viewed side-by-side, monochrome or color anaglyph, horizontally-interlaced, vertically-interlaced (Sharp 3D LCD), and page-flipped (shutter glasses). They also are listed as NVIDIA 3D Vision Ready. I found these tools very helpful for quickly showing files for demos, and, in particular, StereoPhoto Maker is great for demoing the different common 3D formats. You can also set it up to flip back and forth between the left and right image to help show the difference between viewpoints only a few inches apart. For creating more extensive productions, you can move on tools like Roxio Creator 2011, which takes the venerable digital media suite into stereo, with 3D video editing and sharing your 3D productions on DVD or Blu-ray disc (see earlier post). Creator also supports 2D to 3D conversion to add a sense of depth for both photos and videos. Entries posted to Manifest Tech Blog in November 2010, listed from oldest to newest.